11-335 Features: -Grease gun. 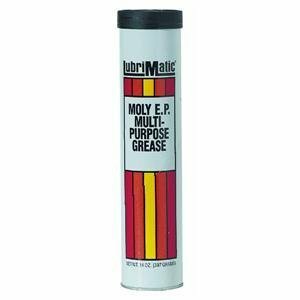 -Addition of molybdenum disulfide to lithium-based grease makes Moly EP grease especially effective for sliding motions, such as sleeve-journal rotating shafts and ball joints. -Contains extreme pressure additives to reduce scuffing, scoring and seizure with high loads. -Use in disposable grease gun. Product Type: -Lithium Grease. Generic Dimensions: -9.25" H x 2.1" W x 2.1" D. Dimensions: Overall Height - Top to Bottom: -9.25 Inches. Overall Width - Side to Side: -2.1 Inches. Overall Depth - Front to Back: -2.1 Inches. Overall Product Weight: -0.94 Pounds. If you have any questions about this product by Plews, contact us by completing and submitting the form below. If you are looking for a specif part number, please include it with your message.